Notice that all LSAs learned over the Virtual Link have the Do Not Age (DNA) bit set. This indicates two things: First R4 won’t expire these LSAs unless explicitly told by R3, but it also means that R3 will never flood these LSAs to R4 again. This is a result of RFC 1793. OSPF considers Virtual Links “demand circuits”, like old dial-up links, and tries to minimize the amount of information sent across them. The DNA bit set on these LSAs is carried on to R5 as well. First, notice that this has the DoNotAge flag set, since it was learned over the Virtual Link. Now we know a segment and the DR on that segment, let’s look at the LSA generated by the DR, the Network LSA. The link 10.23.0.0/24 is attached to router 192.168.0.3 so again, let’s look at the Router LSA. Inside the Router LSA we see that this is where our Virtual Link terminates. We can also see the link we use for that virtual link, 10.34.0.3. This link same link is in the R4 Router LSA, so we’ve just built the tree from R4 up to R1! 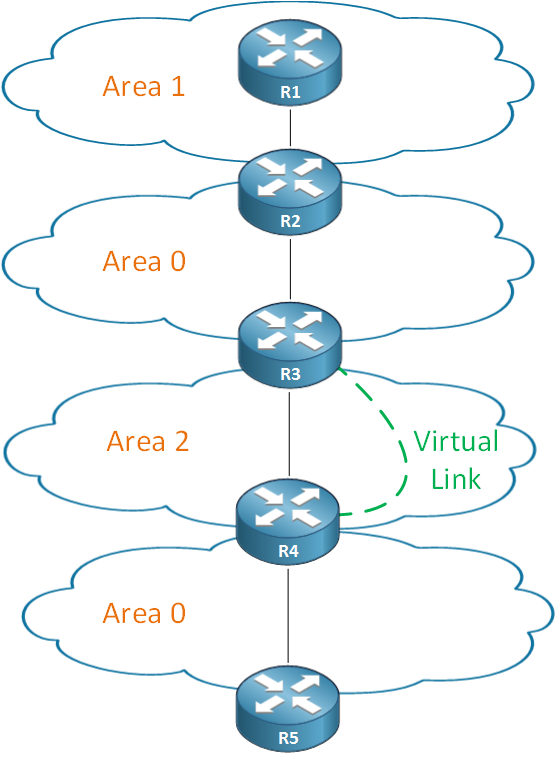 The OSPF Virtual Link doesn’t change forwarding. There is no encapsulation (that is, the packet on the wire is what was sent from the host, it’s never wrapped in another IP header). The Virtual Link allows two routers to send unicast OSPF Updates to one another containing information about Area 0. The other important note is that all LSAs received over the Virtual Link are flagged with the Do Not Age bit, so there is never a periodic refresh, like you will see with other LSAs. So don’t get overwhelmed with the complexity of Virtual Links, just remember they only change the way LSAs are exchanged, they do not change how traffic flows. This entry was posted in ospf, routing and tagged ccie, ospf, routing. Bookmark the permalink.